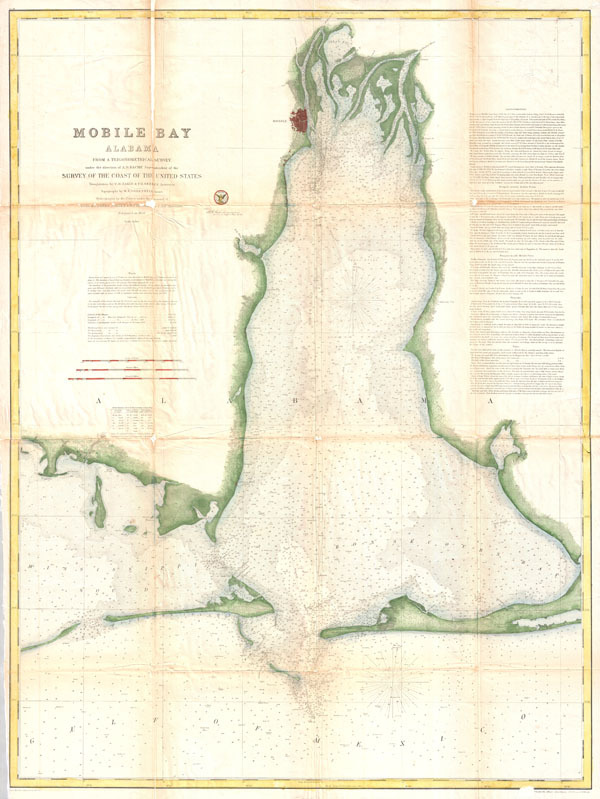 This is an uncommon 1856 U.S. Coast Survey Chart or Map of Mobile Bay, Alabama. Covers from Grand Bay and the mouths of the Alabama and Apalachee Rivers south to Mobile Point, Dauphine Island, and the Sand Island Bank. Also extends westward into the Mississippi Sound to roughly 18 degrees west longitude from Washington D.C. Includes the city of Moblie, Alabama as well as excellent detail of the nearby river delta. Countless depth soundings throughout. Notes on tides, under sea dangers, and sailing instructions in the upper right quadrant. The Triangulation for this survey was completed by E. M. Eakin and F. H. Gerdes. The topography is the work of W. E. Greenwell. The Hydrography was accomplished by a party under the command of B. F. Sands, J. Alden, and C.P. Patterson. The construction of this chart was supervised by A.D. Bache, one of the most important and influential early superintendents of the U.S. Coast Survey. Published in the 1856 edition of the Superintendent's Report. Good. Minor toning and repair work along original fold lines - see zoom. Blank on verso. Lower left margin narrow, but framable. American Philosophical Society, Map Collection, 663: 1856: Un38mba Large.